【Muscle toning and fat burning】- The Abs stimulator is designed for abdominal, arm, leg, hip, waist muscle training. It can help you tones, tightens, strengthens your body muscle, also can promote fat burning to lose weight. Get slim attractive body shape easily. 【High-efficient body shaping】- You can use it 2-4 times per day, 20 minutes per time. It equals to 1500M running, 60 minutes sit-ups and swimming for half an hour, 2 weeks of dieting. You will see the effectiveness after using about 2 months of the muscle toner. 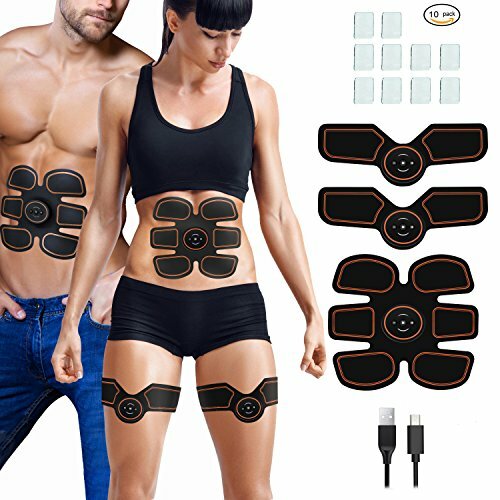 【EMS healthy exercise technology】- This muscle training gear adopt bionic micro-current stimulation technology to stimulate muscle do exercise, healthy and safe to shape your body. 【Portable wireless muscle trainer】- The rechargeable wireless fitness equipment features thin and lightweight, convenient to carry in bags and can be worn unobtrusively under your clothes. Achieve to do exercise anytime anywhere. 【What you get】- Our muscle fitness equipment includes 1 x Abdominal Muscle Trainer; 2 x Arm/Leg Muscle Trainer; 3 x Controller; 10 x Replacement Gel Pads; 1 x USB Charger; 1 x Manual.